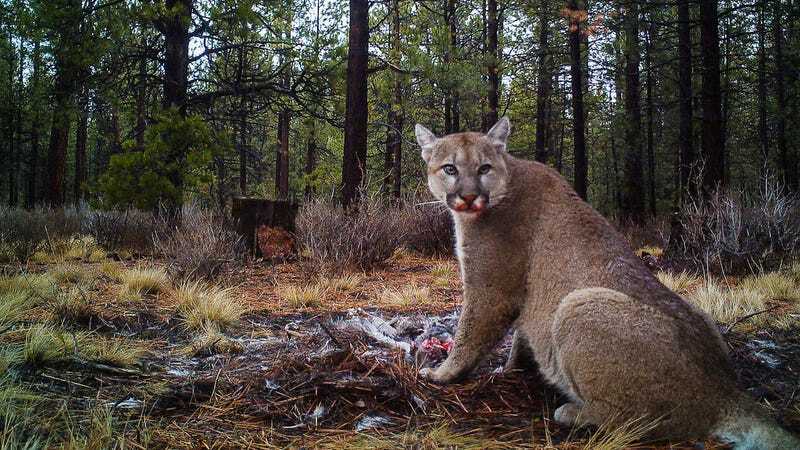 We typically think of large predatory animals like mountain lions as fearless beasts that’ll stop at nothing to procure a meal—even if that meal consists of human flesh. New research suggests that this view is wrong, and that big cats don’t like to bump into us any more than we like to bump into them. Problem is, this fear of humans is altering the feeding behavior of big carnivores, and that may not be a good thing. A study published led by by scientists from UC Santa Cruz and Western University in London, Ontario and published today in Proceedings of the Royal Society B, suggests that mountain lions in the Santa Cruz mountains, sometimes known as pumas or cougars, are spooked by the sound of human voices. These fearful encounters are causing the carnivores to flee their kill sites. Afterwards, some pumas—albeit very slowly and cautiously—will return to their fallen prey, resulting in a 50 percent reduction in their feeding time on average. To make up for these lost meals, the pumas have to kill more deer, which often requires them to encroach upon human settings. In other words, fear of humans is altering puma behavior, and subsequently, their role in the ecosystem. We’re increasingly learning that large carnivores like pumas and wolves are critical to the health and stability of ecosystems. Last year, similar work by the same team of researchers confirmed a long-held notion that carnivores perform an important role in ecosystems by inducing fear in their prey. The presence of large predatory animals, the study showed, generates a “landscape of fear” that alters the feeding behavior of prey animals, which subsequently influences their impacts on other species down the food chain. “What this new study shows is that large carnivores like pumas can experience an almost identical situation, living within a landscape of fear generated by human activity that in turn affects the large carnivore’s relationship with its prey—in this case, deer,” said study co-author Justin Suraci in an interview with Gizmodo. To assess a potential fear response in large carnivores, the researchers placed audio equipment at puma kill sites in the Santa Cruz mountains. Whenever a puma came to feed, its movements triggered a device that broadcast recordings of people having conversations at natural volumes. The researchers used recordings of Pacific tree frog vocalizations as a control. A hidden camera captured images of the animals’ responses, revealing that pumas almost always run away from human voices, but practically never from the sounds of frogs. Across 20 experiments involving 17 pumas, 83 percent of pumas fled when exposed to human voices, and only one puma ran away when hearing frogs (wow, that must be one nervous puma). Revealingly, pumas took longer to return to their kills after hearing human voices, reducing their feeding on these kills by half. Previous work from these scientists revealed higher kill rates of deer in more urbanized settings, and this finding is finally offering a plausible explanation as to why. Unable to eat the entire carcass in peace, the pumas are forced to kill more deer, which ironically often leads them into contact with more humans. More dead deer may seem trivial, perhaps even potentially beneficial, but the change in hunting habits could be altering the ecosystem in unexpected ways. There are often downstream effects to consider—but future work will have to suss this out. “To our knowledge this is the first direct experimental test of whether large carnivores respond fearfully to human presence, and whether this response has measurable ecological consequences,” write the researchers in their study. That mountain lions fear humans may come as a surprise to some, but there’s good reason for this behavior. As to how pumas learn this behavior, Suraci says that’s a much trickier question. All of the pumas in their study had some form of human habitation or development within their home range, and were likely to have experienced interactions—some of them potentially negative—with people. Suraci says it may also be the case that puma kittens, who spend up to a year with their mom, learn appropriate human avoidance behavior from her. It may seem counterintuitive and even dangerous to maintain populations of large carnivorous animals, but Suraci says they’re important for maintaining balanced ecosystems, preventing outbreaks of smaller predators (e.g. raccoons and coyotes) and large herbivores (e.g., deer) that act as pests to humans and can devastate biodiversity when unchecked.